Snippets from Springdale: Life Is Good! A couple of months ago I received an email from Marta inquiring if she could use one of my photos for the cover of the magazine she worked for. Well, that blew my socks off. And what is so ironic is that this is a Texas magazine (where I grew up). Obviously I still have some of that Texas in me for a gulf coast magazine to reach out to this midwestern gal. I have been in the midwest far far longer than I ever lived in Texas, but some of those southern genes just stay and never leave. Ofcourse I said yes. My only request was that I would get credit for the photo, which as you can see, they did. I received two copies in the mail on Tuesday, one that I shared with my B&N group on Wednesday, now I am sharing with you. Let me tell you, it's quite humbling to be singled out from afar to publish a piece of my photography. 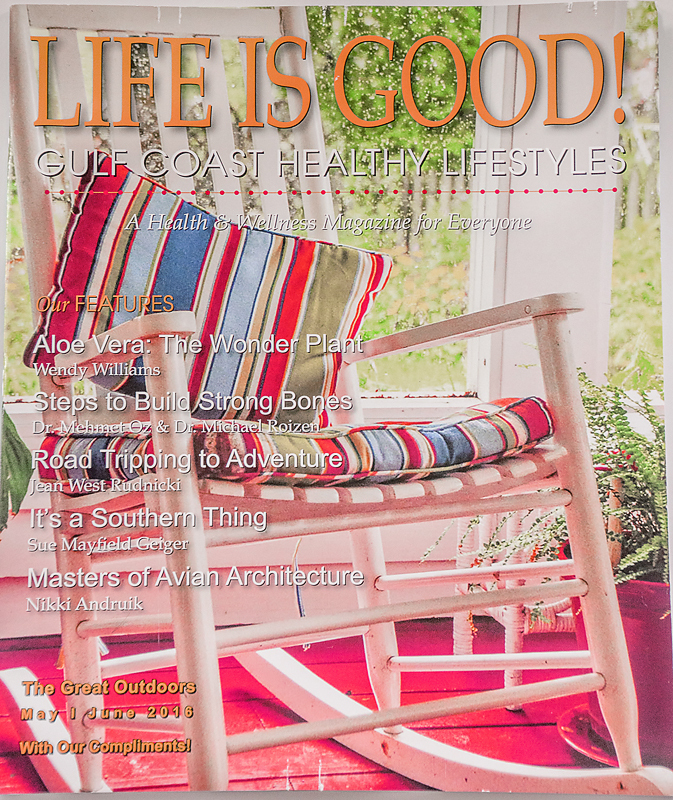 My friend, Sarah, from Paisley Rain Boots, recently had a whole article along with photography and her wonderful story-telling published in a well-known lifestyle magazine. I can imagine her thoughts when approaching the magazine rack at her local B&N. 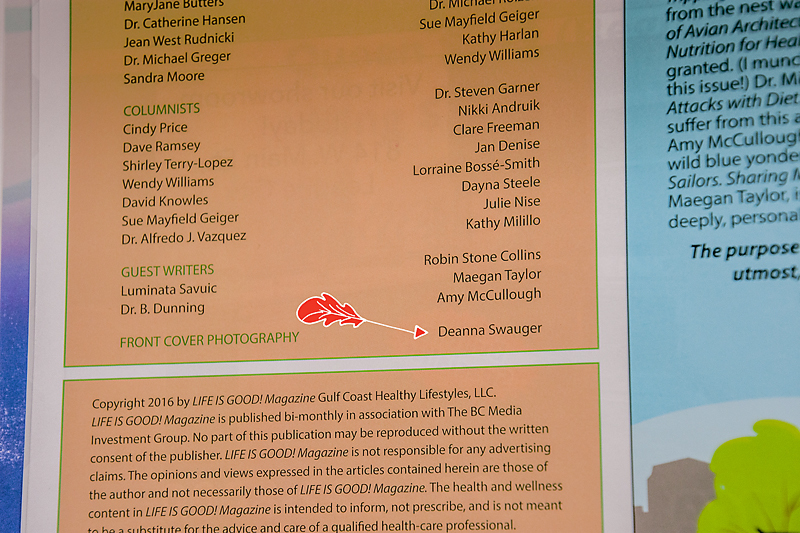 Admittedly I won't have that same awe, since gulf coast healthy lifestyles is not published around here, but it doesn't extinguish that same sense of wonder to see your photography and name published. Congratualations to us both and to all those who have been singled out for their talents and there are many. My only regret is that I didn't begin this love of photography much earlier in my life, but I will keep at it until my hands can no longer hold my camera or my eyes can no longer see. Congratulations Deanna! It's a lovely pic! What a lovely photograph! Congratulations my friend. Well deserved! A bright and beautiful photo that says "summer!" Congratulations, Deanna! Yay! Now more people can enjoy the talent we love. How wonderful and congratulations. It looks really good. That is fantastic! Congratulations!! It's the perfect cover photo for that magazine. This is awesome and well-deserved. Celebrate!!! Ho exciting to see your photograph in print! Well done! It's such a summery shot as well. So the Texas girl gets back to her roots in the nicest possible way! You and I both have that regret that we didn't start sooner, but the important thing is that we are doing it now, and will keep doing it for as long as we can. How awesome is that a front cover photo, and to think I sat in that famous rocker. Well done my friend, and your photography has always inspired me. I love that you are posting more again too, I have missed you, and knowing what is going on with your life. Congratulations Deanna . . . Perfect photo for the Life Is Good cover . . .
An honor indeed . . . Awesome and big kudos to you!!! All I can say is that they were too long in finding you!! Way to go! That's a wonderful photo and a really great honor to have it on a magazine cover. Congratulations! I feel like I just stumbled across a celebrity !! My neighbor started out taking pictures as a hobby and now he has sold some to restaurants and office buildings. We are quite proud of him as I am of you!! That's wonderful Deanna, an amazing honour, giving greater validation to your photography heart and skills. 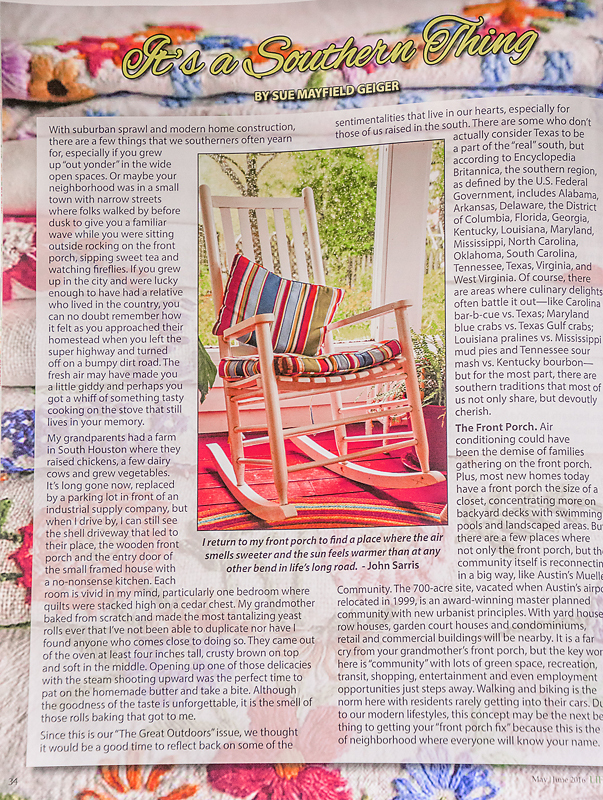 I've had an Australian quilt magazine reach out to me and include some of my work and photos - always a thrill to see your work /photos in print. Nice! And so well deserved.